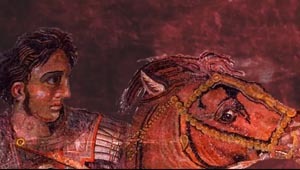 The newest WellesleyX course, "HIST229x: Was Alexander Great? The Life, Leadership and Legacies of History's Greatest Warrior," launched at the beginning of February and is off to a great start. Hist229x instructor Guy MacLean Rogers, Mildred Lane Kemper Professor of History and Classical Studies, recently blogged for Inside Higher Ed about the start of the class, detailing the results of a survey administered to course takers. Some 17,500 people from over 130 countries, ages 12 to 86, are registered for the class and, of them, around 3,400 students have taken a course survey about historical leadership and attitudes toward Alexander the Great. Survey takers selected intelligence (17 percent), the ability to persuade others (13 percent), and vision (11 percent) as the three most important characteristics of an effective leader in our survey, and 64 percent of them thought that leadership was both genetic and could be taught. Read more about the survey results in "Alexander the MOOC Lifts Off" on Inside Higher Ed. Rogers also recently spoke with the financial advice site NerdWallet about the Future of MOOCs, stating that he thinks MOOCs are "here to stay." Read "Professor Perspectives: The Future of MOOCs" on the NerdWallet blog. Guy MacLean Rogers is a classicist and historian of Greek and Roman history and the author of Alexander: The Ambiguity of Greatness (Random House, 2004) and The Mysteries of Artemis of Ephesos: Cult, Polis and Change in the Graeco-Roman World (Yale, 2013).